Markos Moulitsas  alias "Kos"  created Daily Kos in 2002, a time he describes as "dark days when an oppressive and war-crazed administration suppressed all dissent as unpatriotic and treasonous." Be careful what you wish for. With the Bush years now just a memory, Kos's blog has lost its mission, and its increasingly rudderless posts read like talking points from the Democratic National Committee. 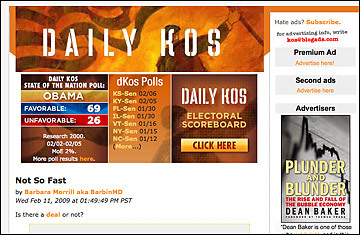 See Daily Kos in TIME's 2008 blog index.